Rejoice! Football season is upon us, and with it, the unavoidable desire to park it in front of a TV and take in every down, tackle, kick and fumble. While your den or living room might make for a serviceable television destination the rest of the year, football season calls for a special place uniquely suited for the demands of binge watching sports. Enter, the man cave. But what if you don't have a room in your house available for such a service? 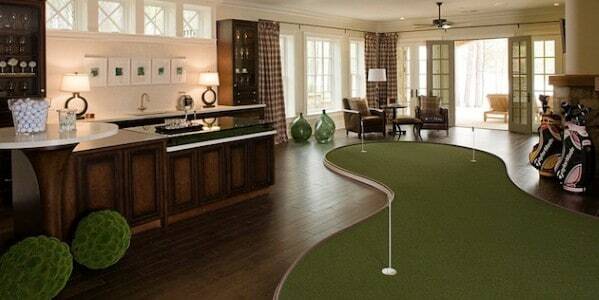 And what if you're looking to truly set your man cave apart from the crowd? May we suggest the garage? Think about it: an arena that we mostly associate with testosterone and the masculine creation of cars, tools and grease slicks. What more perfect place to elevate to than a room full of comfort and style. It not only functions as the perfect place to watch the game, but allows you to kick back and relax any time. 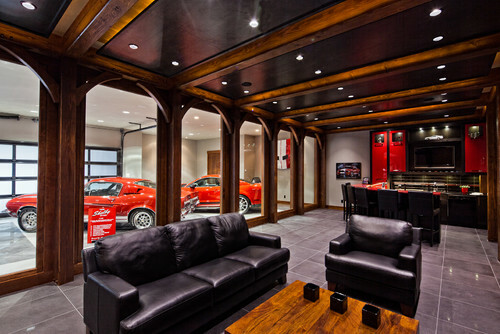 Garage man cave or the more standard variety, no two man caves are alike. They're defined by the interests and passions of their inhabitants. 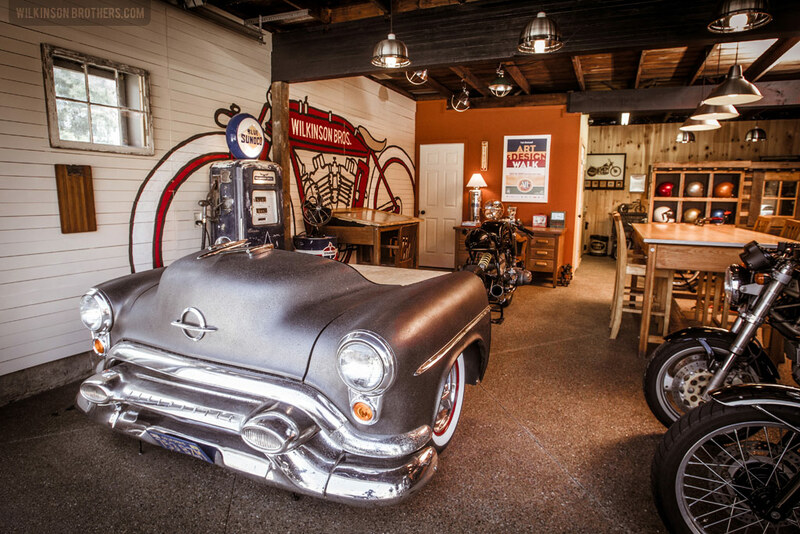 So let your imagination run wild, and see if you can find inspiration in one of these 20 ultimate DIY man cave garage ideas. Nothing says man cave like leather seating on a hydraulic lift. In this case, the lift can spin the seats around to face either a theater-style screen or a multiple TV display to take in all the games. 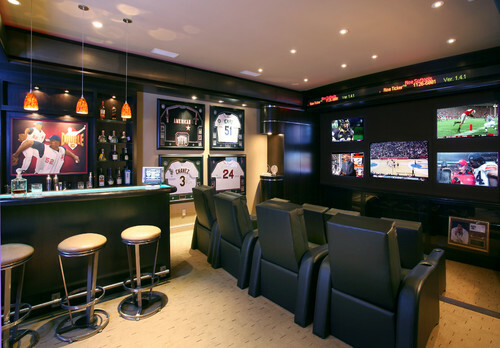 If you're game fan enough to create a custom man cave, chances are you've got a decent collection of memorabilia from your favorite team or teams. You might as well show it off. If you're looking for a swank place to enjoy a game of baccarat, while the other game wages on the field, try this marble-floored, Tucson-tiled beauty on for size. Sip on your bourbon neat, watch the cigar smoke swirl and enjoy the muted tunes of Ol’ Blue Eyes spinning on the turntable in a nostalgic room inspired by the Rat Pack era. Crystal decanters and red velvet wallpaper add a touch of class to your Sunday lineup. 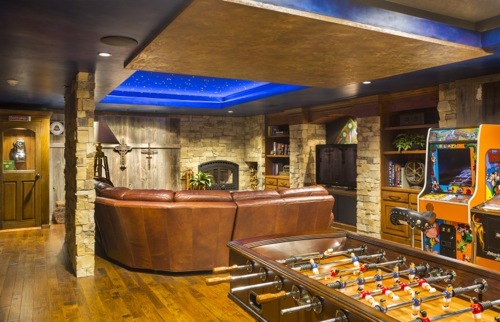 Channel your inner rock star with this music-themed man cave, great for jam sessions, band practice and pre-game freestyling. Musical ability not required. With luxury leather seating, state-of-the-art projection and surround sound, this movie lovers' paradise is ready for its walk down the red carpet. The clean lines of the paneling and understated décor elevate this humble man cave to studio executive screening room. Hint: It’s perfect for taking in your must-see ball games, too. Poured concrete walls shaped and painted to look like rock surround this cozy nook that gives new meaning to the term “man cave.” Uncork some choice selections from your wine collection for the big game, and spend four quarters as a stowaway in your personal rustic hideaway. Whoever said garages have to be grease-stained sweatboxes? This car lovers’ retreat boasts marble floors, leather couches, flat-panel TVs and single malt Scotch, as well as space for a half dozen cars, parked in a pristine climate-controlled environment. No need to deny your inner geek. Let your nerd flag fly. This man-child utopia offers itself as a display room with built-in shelving for all your favorite action figures. What better way to watch your grown-up heroes battle it out on the field than in close proximity to your childhood idols. 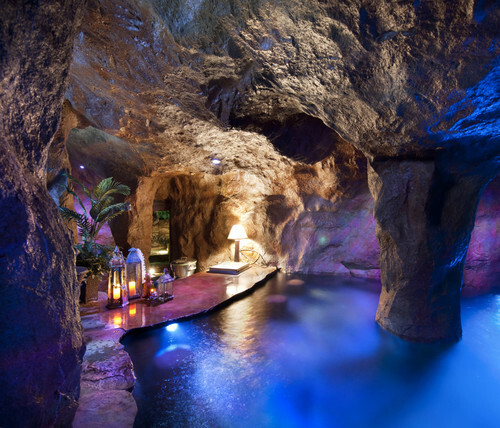 This water-filled grotto comes complete with a swim-up bar, waterfalls, underwater seating area, grotto kitchen and flagstone patio with outdoor television and sound system. This space has everything you need for an exotic, deep-sea adventure in your own backyard. Get your engines revved up for kickoff in this room decked out with vintage gas pump, drink cooler, flat-panel TV and tool chests. Indoor motorcycle parking included. Any respectable armchair quarterback and fantasy football commissioner knows that watching just one game on any given Sunday is like eating just one potato chip, i.e., impossible. With multiple screens, football memorabilia lining the walls and comfortable leather chairs for you and your friends, this room is truly an MVP. A warm fire, a shot of whisky, a good hand at poker and running the billiards table are all things that can be found in this Western-themed refuge, complete with an audience of deer to watch the game with you. 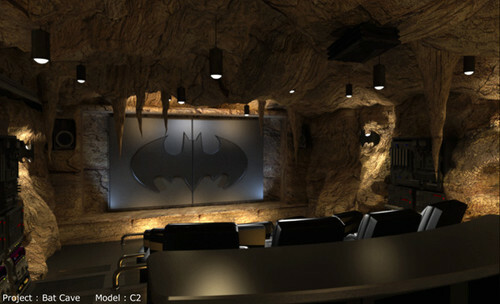 Home theaters are often themed, and this comic superhero-inspired cinema room takes it to the next level, with faux stalactite formations and a telltale logo screen cover. There’s plenty of room for friends and family in the plush theater seating, perfect for settling in for the championship game. Clean contemporary design and side-by-side bowling lanes are the hallmark of this classic space for entertaining, game play and game watching. Be the first on your block to sponsor a league right in your own home. One day, you want to play pool. The next day, you want to play cards. Another day, you’re in the mood for classic video games; but some days, you love the challenge of foosball. What to do? Build out a room that has it all. This ultimate game room has space for most of the activities you’d ever wish for, plus plenty of seating to watch your TV's on game day. A state-of-the-art projection system and tracking technology make playing a round of golf (this link is broken) from the comfort of your home a reality. Now you can play a round at Pebble Beach then Pinehurst in the same afternoon. Have the world's most exclusive courses at your fingertips - no caddy required. 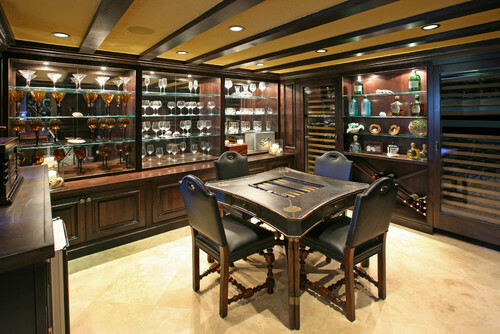 Dark wood paneling, glass shelving containing ornate glassware, floor-to-ceiling wine coolers and ample bottles of premium liquor make the perfect entertaining space for the reserved, dapper gentleman. 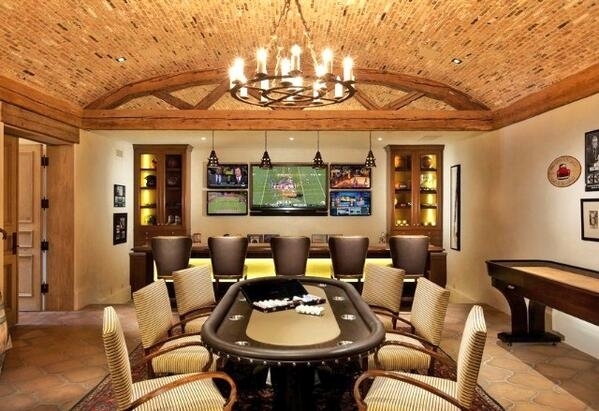 Strike up a game of backgammon and chess during the halftime lull. No one likes sitting in traffic, but sitting behind a desk made from a classic car gives new meaning to being in the drivers seat. This bespoke desk is attention grabbing and a real conversation starter, lending your man cave a truly unique design. Watch your team go wild on the field among the wildlife! 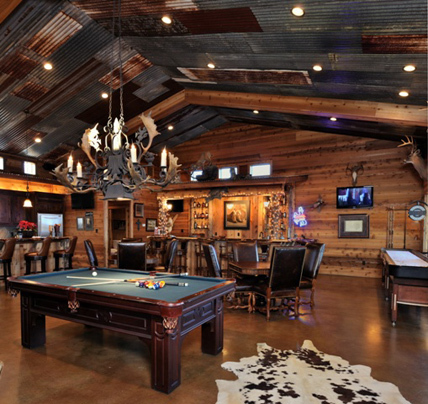 Filled with trophies of conquests posed in museum-quality scenes, this room provides a unique man cave experience for big-game hunters and non-hunters alike. Sometimes you just want to steal away to a cozy room where you can strum a guitar, paint on canvas and read a good book. This kit from a greenhouse company offers private space with a funky flair. It can be wired for electricity should you choose to catch the game in boho style.